Buy discount dressage bits and Browse our massive selection of high quality equine products. These particular Dressage Bits are top quality horse tack gear. Horse Tack Now is an online horse tack store specializing in great horse tack products. This Mullen Mouth Dressage Bit is just what your horses need. 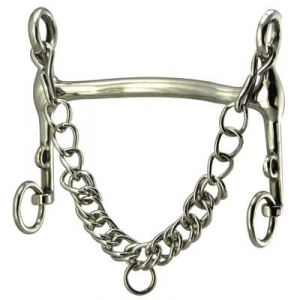 It is designed to spread pressure in the horses mouth and measures 14mm mouth and 3'' shanks. Only the best Horse Dressage Bits are sold at Horse Tack Now for your Horses.